Well, then you deserve one too, Green Eyes! Awe Thanks Brandi. Hows it going in your neck of the woods? Have you heard any thing on your neighbor? Everyone considered yourself loved and kissed today, except for CC, he is loved, but I don't kiss married men specially with these red lips -- thanks Brandi! Oh Monkeys I am so frustrated. About a month ago some punks took the back wheels off the car next door. Called the local LE got since I didn't have a name etc of the owner they couldn't take a report. But she would send out someone to check it out. Which they never showed up. Last night they came back and took the front wheels. The problem being the house has been empty since we moved in almost 7 years ago. The couple that lived there he was put in jail for beating her up. She moved out with the two little girls with her parents. The car has sat there all this and there is still power and water on. Someone comes a couple times a year. I figure to turn the AC on and then to turn the heat on for winter. With the car sitting in the drive way on blocks only shows it's empty. I feel bad as there is nothing I can do. I heard the truck last night but was feeling to bad to get up and look. I wish now I would have. I'd call the non-emergency number for your local LE and report it. At least there will be a record of it having been reported. Not a whole lot you can do with little information. Hopefully, because these crimes are being committed, the LE will be on the lookout both for similar crimes and maybe check out the area with patrols. No need to worry about having not called in the middle of the night. I seriously doubt if LE could have or would have gotten there fast enough to catch the thugs. Don't beat yourself up over this, for goodness sakes! Wow GE, hate to hear that happening as once it starts they will continue to strip whatever they can.....You'll have to keep an ear out for your vehicles also.....guess you can take one thing from it, the way this Texas Weather eats the rubber, tires won't be of much good after sitting for over 7 years! Those tires are probably dry-rotted after 7 years sitting on the ground, not being used. Hi Babs! Good to see ya! My little car is in dire need of new tires, I can't drive 2 vehicles and prefer my big truck to run around these country roads ( too many rock-haulers) running little ones off the road or just rolling right over them. Hi Brandi, good to see you too, its been so quiet in here of late, sure do miss all the banter that used to pop up here on JSM's thread............Where has everyone gone, or do I just need to get a life? Looks like its about time to change my kitties over to fall/winter, they aren't too happy we have already had a couple of frosty nites , had to get out the heating pads for a couple of the old grumps so time to put the pool away for awhile! Little Sidekick is in Indiana for the Bands of America competition! I finally found a photo of them on twitter. He is on the left. 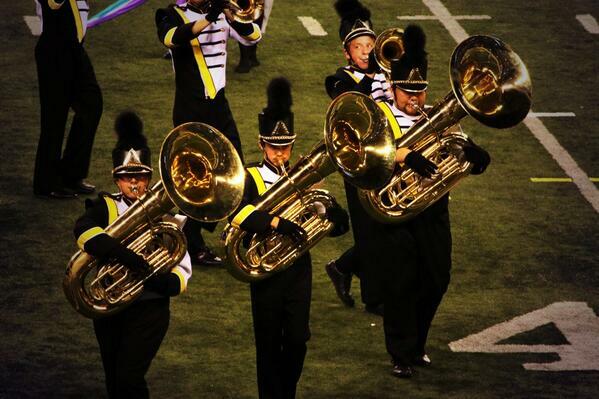 How cute Trimm........Tuba is almost as big as he is! Morning Monkeys Prayers for all in need. Caught the nasty bug going around. Slept over 36 hours the first of the week. Would wake up long enough to take meds have a cup of hot tea and go back to bed. Now it is cough and running nose. Still don't feel like doing much. But that's nothing new. Hope everyone has a great day. I'm sorry to hear you caught that nasty bug GE. I hope you'll be feeling better soon! Thanks Muffy Thank goodness the worst of it is over. I hope. It really hit hard and fast. I never should have said I hadn't hadn't gotten the flu since we moved to Texas. Hope you and the family are doing okay. We're all doing well here. So far (and I hope this doesn't jinx me) we've managed to avoid the flu. The crazy Texas weather has really been something. It was so cold here about a week ago there was ice in the dog's water bowl, yet today I'm out and around in shorts and sandals. Yeah boy, howdy. Huh. I hear you. Had to turn the heat on last week. Down to 27 at night and only 40"s during the day. Had to turn on the AC today as it got so warm.